For the patriots out there, the Stars and Stripes are more than just a flag. It’s all about what the flag represents, and if you’ve served your country, it means so much more. That is the case for Marine veteran Mike King, who is being widely praised after a home surveillance video showed him getting out of his truck to fold up a fallen flag. The flag pole had fallen across the path of Gail Cook’s house in Ferndale on Wednesday following strong winds in the area. Mr King, who now works as a delivery driver, noticed what had happened, and took it upon himself to do the right thing. He set about folding up the flag, in the proper way, and put it in a box on the porch for safe keeping until the winds subsided. He stopped at the house to take care of the problem, even though he wasn’t making a delivery there. Having watched back her security footage to see what happened to the flag, Gail felt inclined to share it in a post on Facebook. 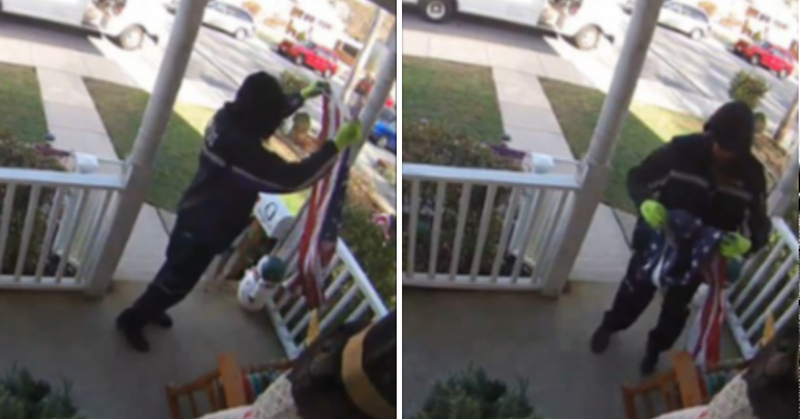 In an interview with CNN, she added: “He stopped and took time out of what (is) surely one of his busiest delivery weeks to pick up our flags and fold them and place them safely on a box that was on our porch. Absolutely right – we at Aunty Acid give always give huge respect to our veterans, and Mr King deserves extra special props for this act of patriotism. The story soon spread on Twitter, with many users calling for his employer, FedEx, to give him a payrise. FedEx responded, and praised him in a statement that read: “FedEx Ground is proud of the many contributions our team members and vendors make to our local communities every day. A lot of people would do just that, but we’re thankful that you didn’t. Here’s to you, Mike King! Thank you for your actions on that day, and more to the point, thank you for your service.